I thought the photos earlier this week were amazing. This little movie, made of 36 ‘smoothed’ or interpolated images of Comet 67P/Churyumov-Gerasimenko, takes it to the next level, showing the comet’s complex shape even more clearly as Rosetta nudges ever closer to its target. Some have likened it to a duck, a boot and even a baby’s foot. The original photos used for the animation were more pixelated, but a technique known as “sub-sampling by interpolation” was used to smooth out the pixels for a more natural look. Be aware that because of processing, 67P C-G appears smoother than it might be. While the surface looks textured, including what appears to be a small crater atop the duck’s head, we have to be careful at this stage not to over-interpret – some of the details are artifacts. No one knows yet how such an unusual shape formed in the first place. Possibly the comet is a ‘contact binary’ made of two separate comets or two parts of larger, shattered comet that stuck together during a low-velocity collision. This may have happened more 4 billion years ago when the icy building blocks of the planets and comets were numerous and collisions far more frequent than they are today. Contact binaries aren’t uncommon; we see them in asteroids and comets alike. * The comet may have once been a more spherical object but after many trips around the sun developed an asymmetrical shape from ice vaporization and outgassing. 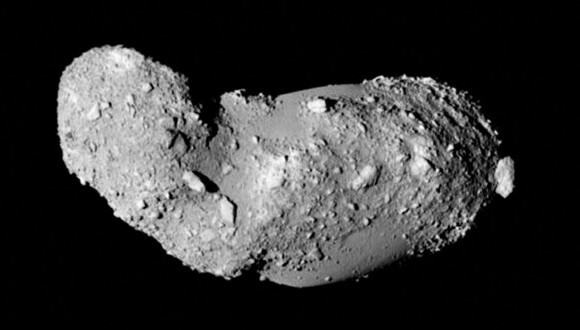 * A near-catastrophic impact blasted away a huge chunk of comet ice. * The strong gravitational pull experienced during a close pass of a large planet like Jupiter or Saturn may have pulled it into an irregular shape. * A large outburst could have weakened a region on the comet’s surface that later crumbled away. In the meantime, keep the photos and movies coming. We can’t get enough. Surely the rotation period is slower than the video! But what IS it? It rotates once about every 12.3 hours. Thanks, good to know and your article is very interesting! I assume the center of gravity lies around the lower edge of the small satelite closest to the main body. But the actual center of gravity probably lies just outside both bodies, balancing the acceleration of the satelite towards the mainbody while also balancing the decelartion (body rotation) of the mainbody towards the satelite. I see craters! Impact or ice sublimation expansion pits? Both? I can’t wait for the next batch of images! I’ll bet we see impact layers too, much like what was seen at Vesta. Thanks for the update and keep us posted! Thanks Tony and Aqua4! I’ll take your suggestion up Plenum.